Our "Heroes" series highlights the work of social entrepreneurs who are providing systemic and sustainable business solutions to improve the lives of millions of people in the developing world. Click here to launch the video player and browse any of the stories in the series. For the past seven years, Bart Weetjens has been running a unique lab in Tanzania, where he trains rats to sniff out deadly unexploded land mines -- the legacy of countless bloody conflicts. FRONTLINE/World travels to Uganda to explore the impact of microfinance and, in particular, how one San Francisco-based nonprofit is using the Web to connect borrowers with lenders, person-to-person online. In rural villages across South Africa, some 5 million people don't have access to clean drinking water. Africa correspondent Amy Costello reports on Trevor Field, a canny entrepreneur who decided to tackle South Africa's water woes in his own enterprising way. 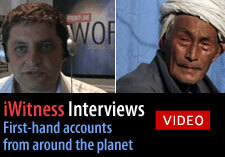 In our series iWitness, we regularly interview journalists on the front lines of the world's trouble spots. Watch recent interviews with reporters covering the Iran crackdowns, the war in Afghanistan, and the African drugs trade. In Vietnam, a country with one of the highest percentages of wheelchair riders in the world, a partnership between an American designer and a Vietnamese wheelchair factory is making a difference. WATCH VIDEO & JOIN THE DISCUSSION » Egypt: Middle East, Inc.
India: "Design Like You Give A Damn"
In 1994, Rwanda was ripped apart by violence so apocalyptic that nearly 1 million people died in the span of approximately 100 days. Rwandans now appear bent on taking responsibility for their fate. Frustrated by Ecuador's lack of health care for the rural poor, Dr. Edgar Rodas created a volunteer group of surgeons in 1995. Their efforts include a hospital boat that regularly visits Ecuador's Pacific coast to provide medical care to the poorest people.